Sikhote-Alin Meteorite Shrapnel For Sale - The Meteorite Exchange, Inc. When a very large meteorite hits the earth it can explode into thousands of smaller pieces. This happened with some of the largest masses of the Sikhote Alin fall of 1947 in Siberia. These pieces of torn and twisted nickel-iron metal were ripped apart by tremendous force when the comic body hit the Earth. They are called shrapnel fragments because they look very much like the twisted metal of a bomb explosion. But, these also preserve characteristics of their meteorite nature in the way they have cracked and torn. These are a must have for any complete collection of meteorites. 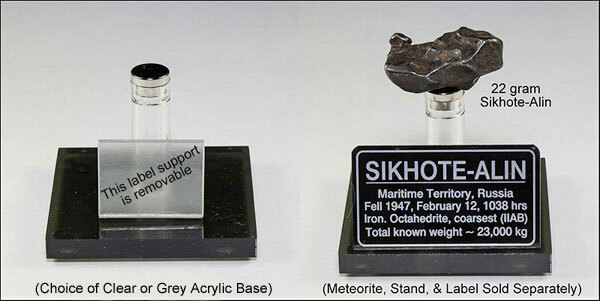 Our magnetic display stands are the perfect way to display your Sikhote-Alin meteorites. The rare Earth magnet at the top of the post holds the meteorite in place. Professional produced aluminum labels for identifying and displaying your Sikhote-Alin meteorites. These magnetic display stands are the perfect way to display small iron meteorites. They work especially well with our most popular Sikhote-Alin Meteorites.